On 28 April 2016, the Australian Government signed a contract with Serco Defence for the design, build, operation and maintenance of an Antarctic Supply Research Vessel (ASRV) with icebreaking capabilities. On the same day Serco Defence signed a contract with Damen Schelde Naval Shipbuilding in Vlissingen for the design and build of this ship. The ASRV represents a state-of-the-art icebreaker which will facilitate Australia’s wider exploration of the Southern Ocean and Antarctica. The vessel will be 160 metres in length, with a beam of 25.6 metres. 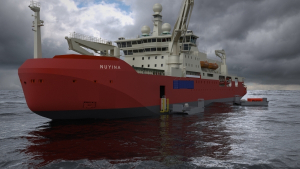 She will be able to break ice up 1.65 metres at speeds of 3 knots and will supply Australia’s permanent research stations in Antarctica and Macquarie Island with cargo, equipment and personnel. Designed with 500 m2 on board laboratory and office facilities, the vessel will also serve to conduct research activities. The ASRV will host up to 32 crew and as many as 116 scientific personnel. Design and engineering has been performed by Damen Schelde Naval. Currently the ASRV is under construction at Damen Shipyards Galati in Romani. During the lecture various unique aspects of the design and build of the ASRV will be detailed. The lecture will be held in hotel ARION, Boulevard Bankert 266, 4382 AC Vlissingen.